FAU: No to sexism in the workplace! Fundraising party for Eleftheria K.
Cakes and informations against sexism at the workplace! No borders for class struggle! Movie screening: The Factory is Ours! The section Hartz IV complex was closed in November 2015. Please contact the general structures of FAU Berlin. The section addresses Hartz IV recipients and those toping off their wages with Hartz IV, Germany's welfare and unemployment system. Are you being penalized for laughable reasons? Are you being forced to work a menial job or to take part in pointless courses? Are you being pushed to move? Whatever your problem, we can come to grips with it together. 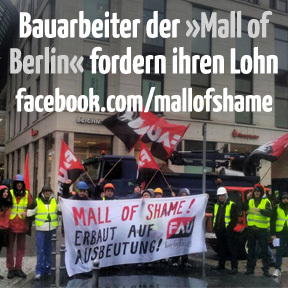 The FAU Berlin is an independent grassroots union. It is part of the German Free Workers' Union (FAU) federation. Join us, take part, get active. Introductory seminar: FAU – How does it work? Every 1st Friday of the month, 7 pm. Open FAU office: Every Friday, 5–8 pm. Labour rights help desk: Every 2nd and 4th Friday of the month, 5–6 pm. Please write in advance to faub-beratung@fau.org. Tenant rights help desk: Every 4th Monday of the month, 6–7 pm. In cooperation with the lawyer Carola Handwerg. Advice for worker and business collectives: See the advice page (german) of the union coop // federation.